We got up before dawn to get ready for an adventure. Supposedly we were going to be picked up at six o'clock by the company we booked with and they got off to a rocky start as they were twenty minutes late. But we were willing to forgive them as this was reputedly a wonderful trip to Sian Ka'an which is a nature preserve and UNESCO site. As we were being driven to our meeting point our driver informed us it would be a rather large group because all the trips yesterday were cancelled due to suspected bad weather which never materialized. So today there were going to be two day's worth of people. Not an auspicious start. He eventually delivered us to a meeting point and when we arrived there were only four or five other people there. Maybe it wasn't going to be too bad after all. Soon more people were arriving and still more as we waited. Eventually there were probably thirty people waiting and we were starting to dread this trip. Our guide Gabriel introduced himself and informed us our group would be ten people including him so we would be taking two vehicles and he looked to me and asked if I would drive the second car. No one else jumped to volunteer so I accepted the responsibility not knowing what to come. He also said we would leave in ten minutes; then twenty minutes later it was five minutes. After we had been at our meeting point for over an hour I was assigned a Jeep and couple was assigned to our car as well. So we set out following our guide with Diana and Alann, a nice couple from France. We chatted as we drove across the highway and turned south. For a couple miles we had paved road and then it gave way to dirt but not just dirt, there were massive potholes and huge puddles from the morning rain. After about forty-five minutes we stopped at a bridge to take in the view and a caravan of an addition dozen vehicles soon joined us. At this point we were offered a bottle of water and a banana; not much seeing as none of us had eaten breakfast. A few minutes later we were back on the road and I soon discovered that the battery warning light was illuminated and that after traversing deep puddles the power steering would cease to operate making it a bit more of a chore driving. But we pressed on for over an hour bumping down the road and trying to strike a balance between speed and smoothness. Eventually we stopped at a roadside restaurant where we were given a snack of tortilla wedged with salsa and soda. Diana fought to make sure everyone had enough to eat which I think we all appreciated and ten minutes later we were back on the road. It wasn't far to the docks where we parked the Jeeps as it started to rain. We grabbed some of our stuff, left the rest in the cars, and climbed aboard our assigned boat and took off. Minutes later we were idling in our own fumes trying to vie for a better view of a sea turtle. All I could think about was the exhaust and what kind of lungful the turtle would get with three boats hovering around him. We eventually saw him and pressed the guide to allow us to leave him in peace. Then we went to see the mangrove forest which we passed at a high enough rate of speed that we weren't afforded the opportunity to take pictures. I was disappointed and just about ready to jump out of the boat but I decided that would only cause additional delay. From there we were shown trees with resting cormorants and frigate birds. Those too we only slowed down as we passed. Eventually we it out to open water where we discovered three dolphins frolicking. I suspect they were playing doctor as their little game seemed less-than-innocent. Here we stayed for about ten minutes to try to get some pictures with the sun glaring off the water. When the guide thought we had enough we were then taken to a spot on the reef where we were allowed to kind of snorkel as we were required to keep our lifejackets on. It was still overcast though no longer raining and visibility wasn't great. There were some nice fish but when our allotted ten minutes was up we were recalled to the boat where they took us to a shallow area to "swim" even though we had been swimming moments before and in an area with something to see. And that marked the end of our boat trip so our captains took us back to the docks where we climbed back into the Jeeps to return to the roadside restaurant for lunch. It was waiting for us and was already getting cold when we sat down. It was probably average at best but we were starving so it didn't really matter. For the trip back to our original meeting point Alann offered to drive and I was happy to let him as it was starting to get dark. The five of us grumbled all the way back, which seemed to last an eternity. Fortunately Diana and Alann proved to be wonderful traveling buddies and by the time our skeletons were pulverized by the bad roads we were having a good time commiserating. When we arrived back at our initial meeting point we had agreed to have dinner together and had the tour company deliver us into Playa del Carmen proper. We wandered to a favorite establishment of our new friends and had a nice dinner and did some people watching. It turned out to be fun in spite of the rather painful and disappointing tour. Before we parted ways we all exchanged information and I hope that we get to see them during our future travels because they seem like kindred spirits. It is now twenty hours since I got up and all I can think of is getting some sleep. 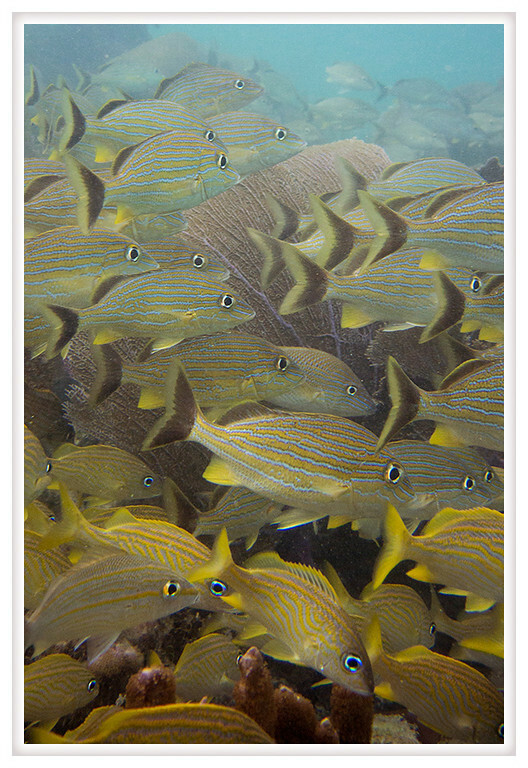 Below is one of the pictures I took while snorkeling. I need to work on it a bit but I was happy to get anything halfway decent under those poor conditions.